Even the most elegant of backyard swimming pools can become quite an eyesore as the years go by. A pool is an inviting place to gather and have fun so long as the area contains a special level of visual appeal. Cracked or broken tiles, excessive grime and slime buildup, and poor choices of surrounding foliage can create the effect of swimming in a city collection pond rather than a backyard recreation center. 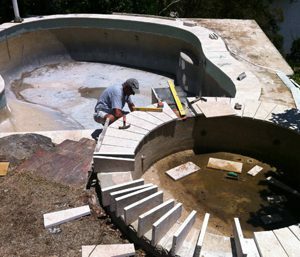 If you are annoyed at the way your pool setting affects your senses, you can perform some extensive renovation work, or you can call the experts. A licensed pool installation and restoration company may turn out to be the most feasible and least costly solution. The most common problem with an aging pool is water infiltration into the tiles or plaster. Over time, a small crack allows water seepage into the supporting soil, and any organic matter that escapes the action of bleach water will discolor the tiles to such a degree that polishing them becomes impossible. A shiny new pool may look as though it requires very little maintenance. However, sediments in the water will immediately begin to eat away at the burnt protective coating of plaster. Although impossible to detect with the unaided eye, this protective coat – which was applied when the plaster material was prepared by the installer – is what keeps water from percolating through the junction between tile and plaster. Nothing sets off and highlights a pool more than a beautiful walkway and splash zone covered in marble, slate, travertine, or other natural stone. However, most homeowners are not sure how to install stone properly, nor can they get the best price on materials from the local flooring surface retailer. Installing stone surfacing involves leveling and compression of the soil, using specialized grouts and cements to secure the individual tiles, and coating the tiles with sealant. This is a job best left to the professionals. Professional pool installation and refurbishing contractors can assist you with choosing the best foliage for your backyard. The correct use of trees and shrubs will complement the look of the pool while adding shade to the proper areas. When remodeling a backyard pool, you must consider all the probable costs involved. These include pool materials including tile, plaster, new drain valves and covers, and adhesive materials. The cost of replanting foliage or adding a splash zone must also be considered. The obvious choice is to contact us for a complete home pool inspection. We offer professional advice about how to transform your backyard pool into a recreational facility that is fit for visiting royalty. Best of all, our work is guaranteed and backed by an unbeatable service warranty.